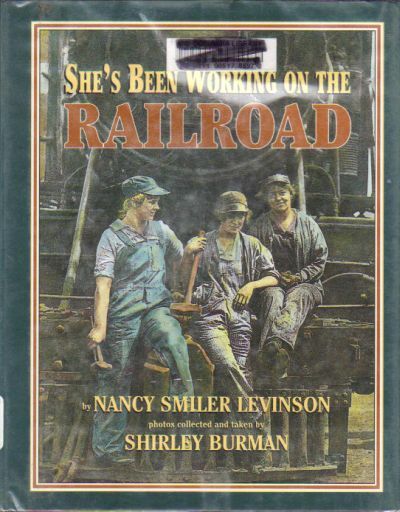 Description: Women's unknown but important contribution working on the railroads is explored in this eye-opening account by award-winning author Nancy Smiler Levinson. She has written the book in collaboration with Shirley Burman, a photographer and foremost expert on the subject of women railroad workers. Tracing their rise from domestic service jobs in the mid-1830s to positions vacated when men went off to fight in two world wars, the book shows how women overcame prejudice to take their place on the railroad workforce. They have served in all capacities, including telegraph operators, architects, yardmasters, welders, nurse/attendants, brakemen, locomotive engineers, and even company president. Featured are many profiles and interviews of these ground-breaking pioneers as well as photographs and artifacts from Shirley Burman's extensive collection. 1997. Hardcover. An ex-library copy with some stamps on front, back inside covers, title page. Dust Jacket in a Brodart-style protector. X-ed out scanning sticker on front plastic cover. Text is clean, unmarked.